Animal Print Birthday Sash - Gold - Cheetah by Lauren Lash Designs at Nicky's Blog. Hurry! Limited time offer. Offer valid only while supplies last. Animal print birthday sash for the girl who wants something unique! These handmade sashes make a perfect gift that she can hold onto and cherish. Animal print birthday sash for the girl who wants something unique! These handmade sashes make a perfect gift that she can hold onto and cherish. Each of our sashes are handmade in our Houston studio. 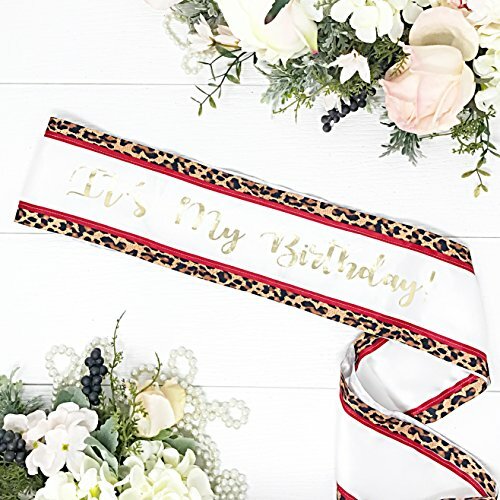 Luxurious satin fabric with a red and cheetah trim make a fun sash with "It's My Birthday" in a calligraphy font. These sashes are made extra long measuring at 72" and clasp together with a pin to keep the sash in place all night. Packaged in a delicate organza bag, ready to gift.